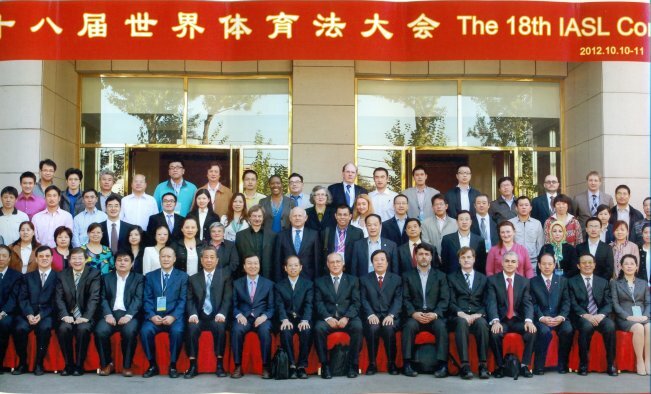 On October 10-11, an International Conference on sports law of high level was held in Beijing by the International Association of Sports Law, with the participation of leading academics and professionals from five continents. Organizer of this Conference was the China Political Science and Law University of Beijing, of which initiator and creator is the Chinese academic and Professor Wang Xiaoping at the same University. Professor Wang Xiaoping (Deputy General Secretary of the Sports Law Research Association under China Law Society, and Executive Deputy Director of the Sports Law Research Center of China University of Political Science and Law), Professor Dimitrios P. Panagiotopoulos, (University of Athens, Attorney-at-Law, IASL President) Professor James Nafziger (Willamette University), Professor Kee Young Yeun, (Dongguk University, the Republic of Korea), Richard McLaren (Alternative Dispute Resolution Center, British Columbia), Professor Yan Xufeng (Head of the Faculty of Ideological and Political Theory of Beijing Sport University, and member of the Sports Law Research Association under China Law Society), Professor Magdalena Kedzior (School of Law and Public Administration, Poland), Professor Ma Huaide (Vice President of China University of Political Science and Law, and Honorary Director of the Sports Law Research Center), Seyedeh Maryam Talebzadeh (Member of the Legal Committee of Iran Olympic Committee) David W. Wu (Senior Partner/Lawyer of Boss & Young Attorneys at Law), Professor Xiang Huiying (Shanghai University of Political Science and Law), Professor Li Baoqing (China University of Political Science and Law), Ms. Karen Jonees (T.M.C. Asser Institute, Netherlands), Professor John Wolohan (Syracuse University), Ms. Mary Wyburn (University of Sydney),Mr. Janez Kocijancic (President of the Olympic Committee of Slovenia) Professor Luo Jiasi (Head of the Faculty of Management, Shenyang Institute of Physical Education, and member of the Sports Law Research Association under China Law Society), Professor András Nemes (Semmelweis University, Hungary), Professor Zhang Linfang (Physical Education College of Hulunbeier University, Inner Mongolia, China), Dr. Kong Wei (Jining University, Shandong, China), Professor Huang Huaiquan (Guangdong Commercial College), Professor Ma Fachao (Central University of Finance and Economics, China), Lucio Colantuoni, (Avv. Prof. of Milan University, Italy), Professor Zhang Xiaoshi (Director of the Physical Education Department of China University of Political Science and Law), Dr. Marios Papaloukas (University of Peloponnese), Zhang Shizhong (Lawyer / Partner of Beijing Dayang Law Firm), Professor Ma Jianchuan (China University of Political Science and Law), Professor Han Xinjun (Beijing University of Technology), and Professor Chen Li (Wuhan University of Technology), Professor Yu Shanxu (Deputy President of Tianjin University of Sport, and Vice-Chairman of the Sports Law Research Association under China Law Society), Professor Tian Siyuan (Tsinghua University), Professor Chen Shurui (Shanghai University of Sport), Dr. Zhang Enli (Xi’an Physical Education University), Professor Tang Weidong (Nanjing Normal University), Professor Yan Chengdong (Tianjin University of Sport), Mr. Zhang Peng (Shandong University), Han Yong (Capital Institute of Physical Education). Within the Conference of IASL, also took place and the General Assembly of the members of the IASL where among others, the standard on the creation of the International sports law Charter was discussed and modeled. The text of the Charter, as it had been already formed at the 17th Congress in Russia, was assigned to Dimitrios Panagiotopoulos, Professor of University of Athens, Greece and President of IASL, Prof. James Nafziger, University of Oregon USA, and Olga Shevchenko Asst Prof. National Law Academy, Russia for further development, in order to obtain its final form before it filed to the competent international organization UNESCO for receiving international recognition. In IASL’s General Assembly, the suggestions and proposals for IASL perspective were discussed, also decided attracting new members and expand the design of a form of memorandum of understanding among the sponsor country and the organizing body of IASL Congress, according to IASL Congress rules, a “guide” form of a global sports law. Finally there has been decided to organize some research programs and Postgraduate programs in sports law, in Cooperation with Universities and Research Centers. The Next international congress (19th) of IASL, will be held in Bali, Indonesia in 2013.